Following on from the previous post, my (Dummy’s) guide for Python with ONTAP! 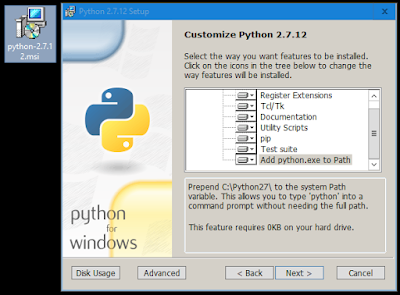 Double-click the python-2.7.12.msi and follow the prompts to install. - On the Customize Python 2.7.12 screen, I select ‘Add python.exe to Path’ (since I have no other version of Python). Below is a very simple Python script example taken from the NMSDK and ZExplore. ii) Edit CLUSTER_NAME, USER_NAME, and PASSWORD as required. status="failed" reason="[SSL: CERTIFICATE_VERIFY_FAILED] certificate verify failed (_ssl.c:590)" errno="13001"
- and had to change transport_type to HTTP, and port to 80, to get this to work.